• Assist Manager with the day to day operations in supplying mill requirements in steam, water, and the disposal of solids in mill waste. • Plan and establishing priorities for the assigned area of responsibility. • Candidates must have a proven track record in safety. An advanced level of knowledge is needed in safety steam/power operation, and water treatment. • A solid knowledge of environmental and governmental compliance laws. Candidates must have 7 or more years of applicable job related experience. A Bachelor's Degree in Engineering is preferred. 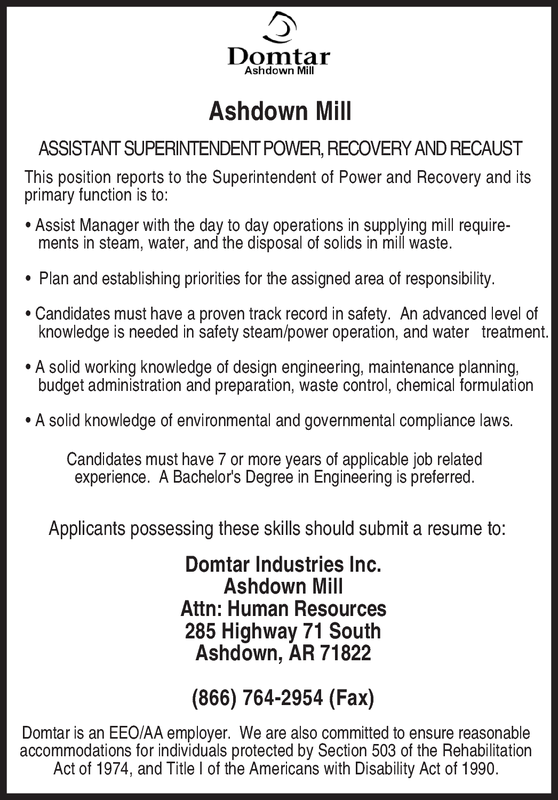 Domtar is an EEO/AA employer. We are also committed to ensure reasonable accommodations for individuals protected by Section 503 of the Rehabilitation Act of 1974, and Title I of the Americans with Disability Act of 1990.